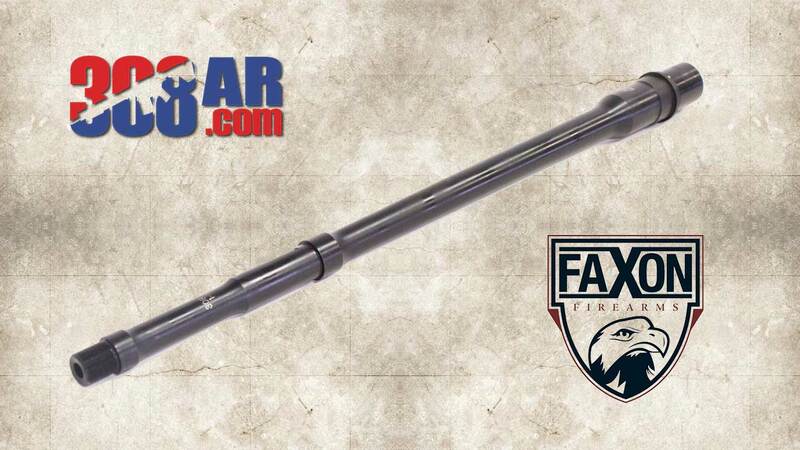 The Faxon Firearms Big Gunner .308 Win. Barrel’s profile is a marriage of Faxon’s Government and Pencil profiles that gives balance of manageable weight and high accuracy potential. It has the Government taper from the barrel extension to the gas block, then transitions to a Pencil profile from the block to the muzzle. Keeping weight at the rear maximizes rigidity and resistance to heat distortion, while removing it up front moves the center of gravity to the rear, keeping your “AR-308” nicely maneuverable. Each Big Gunner .308 Win. barrel is machined from triple stress-relieved 416R stainless steel, and finished it with a tough, wear-resistant matte black QPQ Nitride finish. Faxon Big Gunner .308 Win. Barrels are available in 16″ length drilled for a mid-length gas tube, as well as 18″ and 20″ lengths drilled for a standard rifle gas tube. Gun Tech Note: These barrels are chambered for .308 Winchester. 7.62×51 NATO ammo requires deeper head spacing but will normally will fit the chamber and function. However, Faxon does not guarantee the function of 7.62×51 ammunition, particularly with tight, “mach” .308 Win headspacing.